Procrastination is the enemy of productivity. How much time do you think you waste procrastinating or delaying what you need to do? Whenever we procrastinate, not only do we let ourselves down, we also let others down, especially when they are expecting us to do something. Procrastination does more harm than good so it’s time to put an end to it. 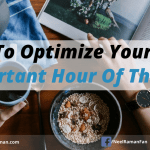 If we manage to put effective strategies in place, not only will we get more things done, we’ll also find that we have more time to focus on the things that are important to us. Procrastination is often a symptom of lack of clarity. It can be lack of clarity of priorities, of deadlines, or of the importance of why something needs to be done. When we procrastinate, we’re generally resisting doing something that’s different to what we normally do. It can also be a sign of being overwhelmed or run down. Over the years, I have found myself wasting less and less time wondering what I should do or when to do something because I have implemented strategies such as those mentioned below. Not only has it freed me up to do more things, it has also helped me do better quality work. 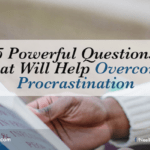 Here are five ways to overcome procrastination, once and for all, which will accelerate how much you get done and create additional time to focus on other things. Stop doing things that don’t matter. Let’s face it — we all do things that we’d rather not do. At times, these are unavoidable. However, if we are clear about our priorities, we really should focus only on things that make the biggest impact or gives us the greatest leverage. If we stop doing things that don’t matter, our motivation levels will remain high as we will only be doing the things that we really want to do. One way to stop doing things that don’t matter is to delegate them out to others. If you’re an entrepreneur, consider getting additional help, like hiring a virtual assistant. That will free up more time for you and you’ll be able to devote more time to the projects you are working on. If you work for someone else, have a discussion with your line manager on how your skills can best be utilised so that you focus on doing what you do best. Create new positive habits. As we almost do everything habitually, it is highly advantageous to create habits that make it automatic for us to do what we’d like to do. One way to ensure that is to do them at the same time every day. In the first month, when it is more challenging to stick to a new habit, one way to overcome it is to set ourselves reminders either in our calendar or diary, or in our phone. There are many tools that can assist us and once these habits are in place, we have them for as long as we want to. Do less but better. This is a motto or operating principle of great companies such as Apple Inc. Oftentimes we procrastinate simply because we have too much to do. If we apply the first strategy, which is to stop doing things that don’t matter, now we get to do less things but we’ll be able to do them better. When we do, it will stimulate our creativity because our mind is not focused on many different things. Doing less things creates the space for us to do our best work. Make a commitment to someone before you do it. This can be a very motivating tactic because when we give our word to someone, not only are we making a commitment to them, we also make a commitment to ourselves. For example, if you’re a seminar leader, one thing to do is to set a date for your seminar and start telling people about it. Not only will your reputation be on the line, if you’re a person of high integrity, you’ll do what needs to be done to be prepared for your seminar. Making an external commitment can be a major driving factor in getting projects completed, on time. Treat your inner child. There is a child in all of us that likes to be rewarded for doing something good. Building in rewards throughout the day can be a good incentive. It doesn’t always have to be something big. Things like taking a longer lunch, adding variety into our day, or finishing early if work get done, can be powerful motivators. The key is to know how you operate. Do you work better when there is a reward on the line or do you work better if there is a consequence for not doing something? Personally, I work better when there is a reward at the end, so I use that tactic to get things done. These ideas aren’t complicated nor are they difficult. One thing to come to terms with is that we all slip up from time to time. However, the key is to learn from it and put things in place to avoid making the same error again. If we don’t apply these ideas, then we won’t be making any changes to how we currently operate and will continue to get the same type of results we are getting. 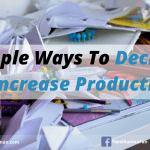 If we do apply these ideas, then it will free up our time to do other things, and also dramatically increase our ability to get more done, make a bigger impact, and have a better experience of life. Action Step: Start with the first strategy and make a list of all the things you currently do. Once you have your list, decide which items you’d like to continue doing and which items you’d like to stop doing. When you have your two lists, find out how you can delegate or outsource the items you don’t want to do. Only focus on the items that are the highest value activities you can do. Question: What strategy, if implemented, will make the biggest difference to you and how much you can get done? Thanks, Neel! My favorite–and biggest challenge–is # 1. Get rid of the little stuff!! I’ve gotten better at getting rid of things that don’t matter Jane! It’s just a matter of sticking to you and slowing over time, you will see a noticeable difference. Thanks for your comment.